Audio Note has built quite the reputation for itself, often implementing extravagant solutions combined with artistic styling. The cable under review, however, looks nothing out of the ordinary which, for most people, is probably a good thing. While not dirt cheap, the Lexus LX is also not brutally expensive. Touted as the more affordable copper variant of the famous Sogon, the Lexus LX apparently offers a large slice of the Sogon quality at a much lower price and therefore actually promises great value for money. 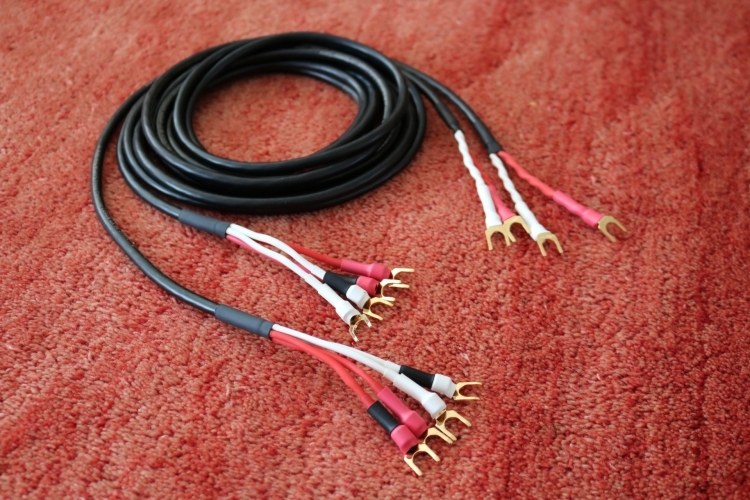 If you have some soldering skills then this off the reel cable looks to be a very interesting alternative to pre-fabricated and terminated speaker cables at similar prices. 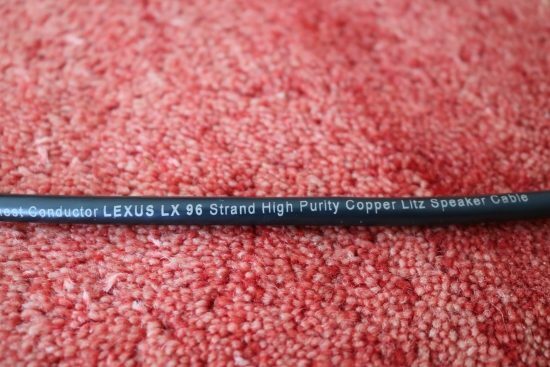 The Lexus LX speaker cable contains 4 conductors and while the insulating materials have equal outer diameters, the amount of copper used on the inside varies, or more precisely, there is a difference in the number of copper litze wires used inside. Of the two red and white pairs, two conductors have roughly half the amount of copper of the other 2 conductors. 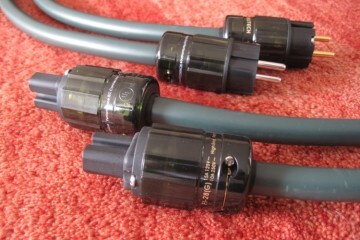 Depending on how you terminate it, the cable can be used in single-wire and bi-wire configuration. 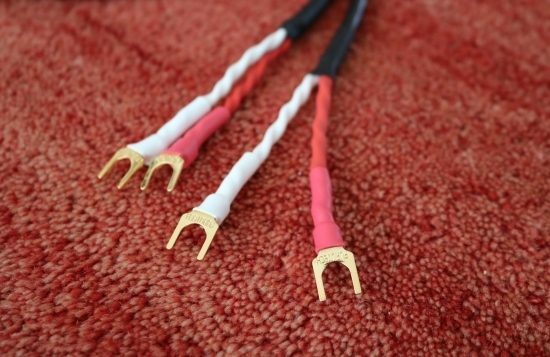 In a single-wire configuration, the thick and thin conductors can simply be bundled together. In bi-wire config, the natural assumption would be to use the thinner ones for treble and the thicker ones for the bass, which is how I used it. It is important to note that the litze wires are individually coated with a very thin insulating layer individually. This layer is invisible to the eye but becomes visible upon heating the wires with a soldering iron or even better by using a soldering pot. 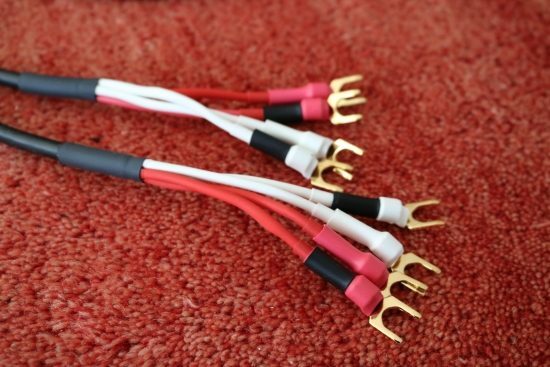 This property naturally prevents the crimping of connectors unless the insulating layers are removed prior to the crimping. Also, when soldering, one needs to be mindful of this and remove all the coating carefully, otherwise the soldered connection will not be optimal. This sounds more drastic than it is though. It comes down to heating the wires long enough for the coating to melt and come apart, then scraping away the residue and re-soldering the wires once more. 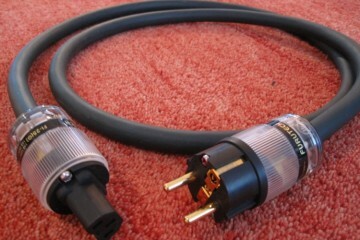 The spades that are used for this cable are the very nicely made Furutech FP-218 Gold. These spades are very easy to solder: the pure copper heats up quickly and makes for very smooth and clean solder connections, unlike the more messy or brittle result using some lesser quality spades that are made of impure alloys. 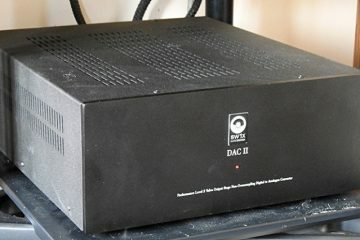 Two systems were used for this review: one consisting of a Jeff Rowland Corus + PSU preamp, Aqua Formula xHD DAC and the NuPrime ST-10 power amp. 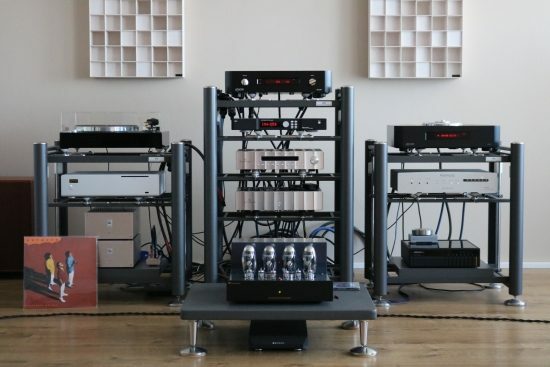 The other system consists of an Ayon Stealth preamp with built-in DAC and the PrimaLuna DiaLogue Premium power amp with KT150 tubes. The source in all cases was the Ayon CD-T II CD transport. The cables were first listened to in my main setup. 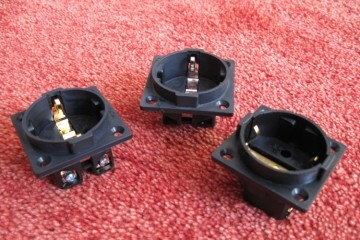 Here they were used to drive 3 different pairs of Apogee Duetta Signature magnetostatic speakers. 3 pairs you ask? 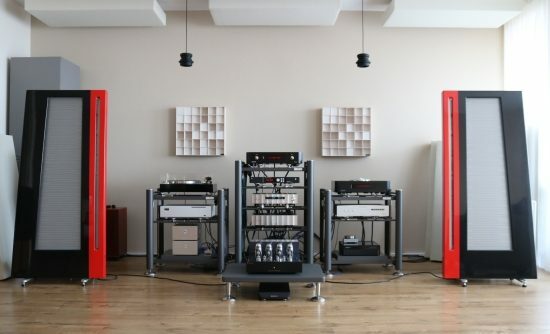 Well, that is the result of audio buddy Jan Cramer having obtained two pairs of Duettas for himself: an original pair and a DIS-restored pair, and bringing them here for comparison. Together with my audio buddy JW’s recently refurbished red and black pair that has been lingering in these quarters seemingly since forever, that makes 3 pairs. Regular readers of my articles will know that I have been using a very affordable van den Hul Skyline Hybrid speaker cable for a long time as it so perfectly complemented the mild-mannered Apogee Divas. 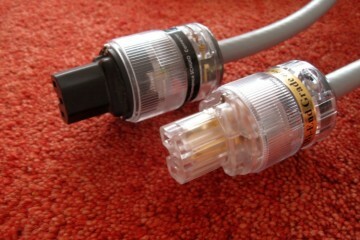 Quite unexpectedly, this cable was even a better match than the very expensive Transparent Reference XL cables. 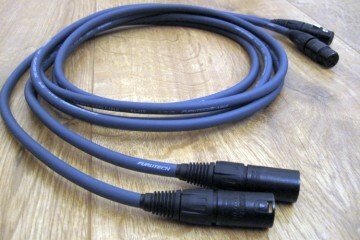 Although I had mixed feelings about using such cheap cables with my high-end equipment, ultimately I simply preferred the new balance and sold the Transparents. An important thing to keep in mind regarding this is that careful matching is usually more important than simply combining random high-grade products. In other words, one has to get the cables to complement the particular situation or personal taste. The Duettas are different animals than the Divas, sounding quite a bit more lively and forward and a lot less smooth. With the Duettas the van den Huls also work well enough, but they tend to sound a bit brash, especially with refurbished (read: on-spec) Apogees. Specifically, the DIS-refurbished Duettas just did not sound right with the Skyline Hybrid. Here the Audio Note Lexus LS with its organic naturalness had a very welcome soothing effect. Don’t assume however that the Lexus LX smooths over fine detail: it absolutely does not, rather the opposite. It is actually very precise, but not at all harsh. Moving on to the red and black Duettas, the Lexus LX sounds smooth and fluid yet highly refined and finely detailed. The LX manages to sound open and airy and it presents all the details of the music without ever sounding harsh or bright in the slightest. Its treble is super-delicate and airy yet much more organic and free-flowing than that of the Skyline Hybrid. The latter is certainly engaging but not nearly as highly resolving, and it sounds bright and unpolished by comparison. The Lexus LX has a civilizing effect on the sound, cleaning up any loose edges, or edginess indeed while remaining utterly smooth and refined. In terms of top to bottom balance, as well as for its sublime treble performance, it actually makes the Duettas sound more like the Divas! 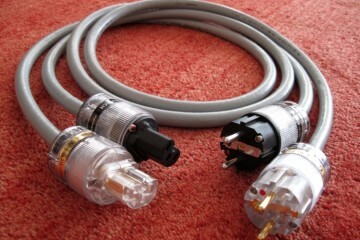 The van den Huls are only entry-level cables, so how about comparing the Lexus LX to the 1600 euro Jorma Design no.3? The Jorma has been my reference cable ever since I reviewed the Marten Mingus Quintet speakers and it has proved itself to be a true chameleon. 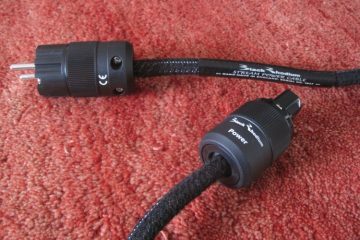 It is this very quality that makes it such a good cable to use for my reviews, as it simply lays bare what other components are doing, rather than imposing its own character on the sound. Compared using Wilson Watt/Puppy system 8 speakers, the Lexus LX quickly proves itself to be very transparent, and its low level detailing is actually on par with the No.3, which is quite an achievement. Perceived frequency extension on both ends of the spectrum is comparable, as is the sound staging and imaging. Where the LX deviates from the No.3 is in its smoother and more relaxed overall presentation. There is no added creaminess and certainly no bloom or thickness, but the Lexus definitely still has a more fluid sound. While both cables are easily capable of letting the connected equipment speak for itself, the Lexus LX does not quite have the expressive timbral texture that the No.3 is capable of. This is easiest to hear in the midrange where the Lexus LX is highly detailed yet friendly and a little restrained and the No.3 is just as detailed but rawer and therefore sometimes more communicative. I feel that the No.3 is the most neutral and expressive of the two, but its precision can also make some recordings sound dry, where the Lexus LX, by comparison, will sound smoother and friendlier. Next, the cables were listened to in audio buddy MP’s setup. 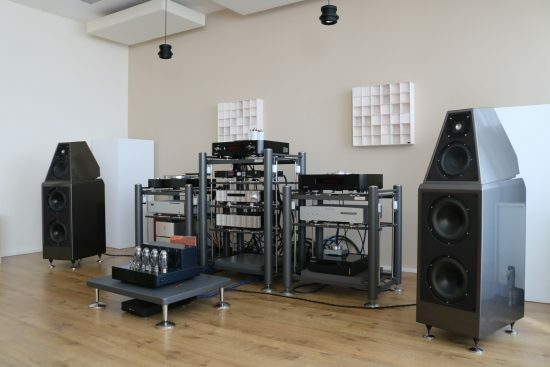 His system consists of a Jadis JP8o preamp, two JA30 power amps, and Sonus Faber Electa Amator II speakers. Here they replaced the Hi-Diamond Power+ B2WI. First, let me share an interesting anecdote that holds an important message. For the longest time, MP had felt that his left channel sounded softer than the right channel, and nothing he did with toe-in, tube swapping or interlink fiddling could cure this. Swapping his cables for the Lexus LX turned out not only to restore the proper balance but also provided a considerably more fluid, refined and detailed sound while retaining overall smoothness. But before I elaborate on the audible differences between these cables first I need to finish the anecdote, so please bear with me. Upon reconnecting the Power+ B2WI and tightening one of the connectors, all of a sudden the other connector just fell off, all by itself! As it turned out, the Power+ B2WI cable’s litze wire ends are soldered into a lump, but not soldered to the connectors. Instead, the connectors are fixed with two screws, which is actually bad practice. It seems this is still not widely known, but solder has a tendency to flow under pressure. So, after many years of use, the once tightly screwed on connectors have become loose, to the point where one of the connectors actually fell off by itself. After checking and tightening all the connections of this cable the balance was fully restored, and the sound was louder, and more dynamic as well. Now we could properly resume the comparative listening. Although MP’s Power+ B2WI has certainly improved now that its connections had been tightened, still these two cables are really quite different, catering to different tastes. The Lexus LX has similar bass depth and punch, which is remarkable given the fact that the Power+ B2WI contains much more copper. 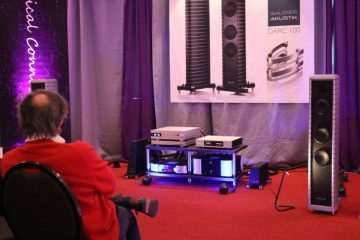 The Power+ B2WI has a relaxed yet powerful delivery and a wide soundstage that fills the room. Within its stage, however, it does not portray very distinct imaging and it does provide the same levels of detail as the Lexus LX. Especially in the aspects of transparency, low-level resolution, and overall treble performance, the Lexus LX is considerably better. Overall, I’ve always felt that the Power+ B2WI is just a little blurry and this comparison confirmed this. This cable tends to let sounds shimmer and linger on, which I perceive as being less precise but this can also make for an emotionally appealing sound. The Lexus LX on the other hand simply reproduces what is in the recording, be it voluptuous and free-flowing or tight and controlled. It can certainly sound rich and seductive, but only if these qualities are present in the recording. It’s rare that a cable sounds smooth, fluid and refined yet highly detailed, fast-paced, dynamic and transparent all in equal measure, but the Lexus LX manages the trick. This is a cable for music lovers who do not want a relentless sound but still want to hear all the details and subtle clues in the music while avoiding breaking the bank. Excellent review thanks Christian. I own the previous iteration of these cables the LX-80 and find it to sound fantastic. My speakers AN-Jlx’s are internally wired with the same cable, actually probably the LX-96, and it is a very synergistic match. Thanks for another great review, Christian. Now you have me interested in these. I compared yesterday the Audio Note Lexus 96 with the Furutech u4.1. Generally your description is absolutely right. 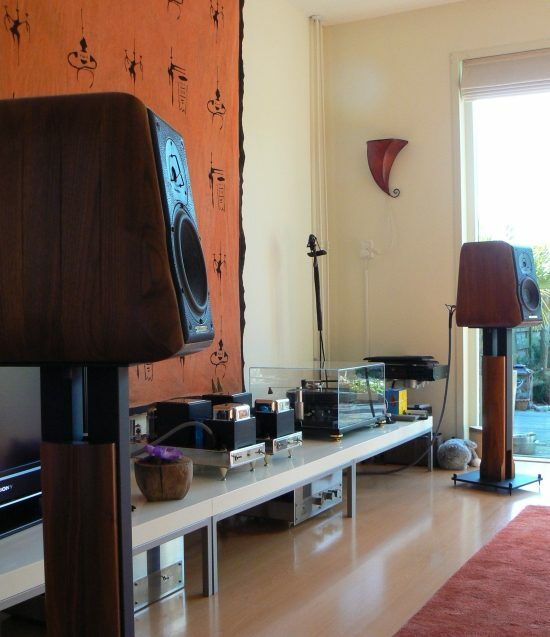 The Music flows smooth and its not easy to concentrate and analyse the hifi criterias. If Diana Krall will sing in your room you forget to check things…Classical old music like Bach Brandenburgische concertos: the flutes sounds like wood. Or classical guitar music with the Lexus, there are not only the strings but rather there is the wood body of the guitar hearable.The Furutech is very fine, transparent, but more colourless, boring and not so engaging like the Lexus.